Well, this one did not exactly come out as I would have liked it to. Part of the reason was that I was trying a few new and different things. The waves were quite lovely and roiling today. 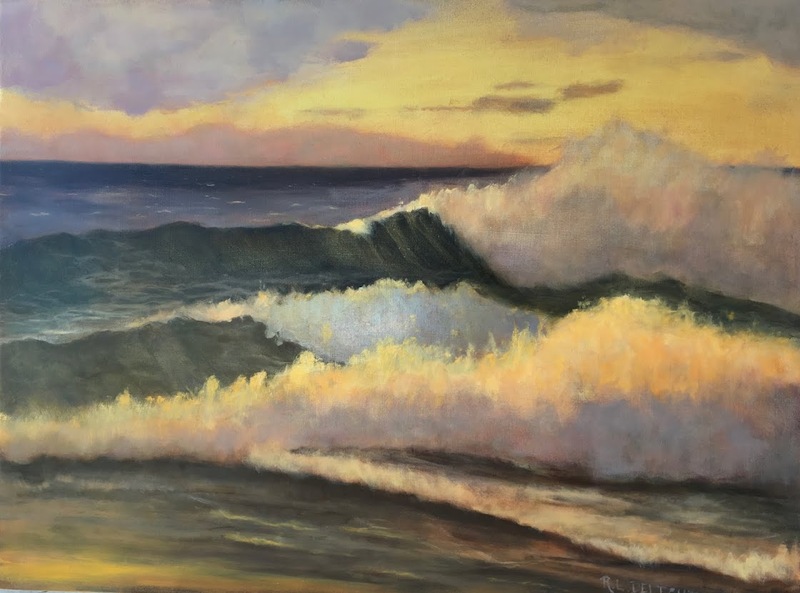 There was at least three times more wave action as what is in the painting. The light was very weird. It wasn't sunny but there were bits of blue in the distance and a front was moving through. The light on the water was a strange sickly color. I painted this late in the afternoon and the water was highly reflective. I believe I used too much white. Actually I didn't start out with too much white but the painting was looking more impressionistic than I liked so I smeared and smoothed it out before going back in on top of it. I admire many paintings and painters that use an impressionistic style but it isn't the way I want to paint. As with every study and painting I do, I learn. Sometimes I learn what not to do! 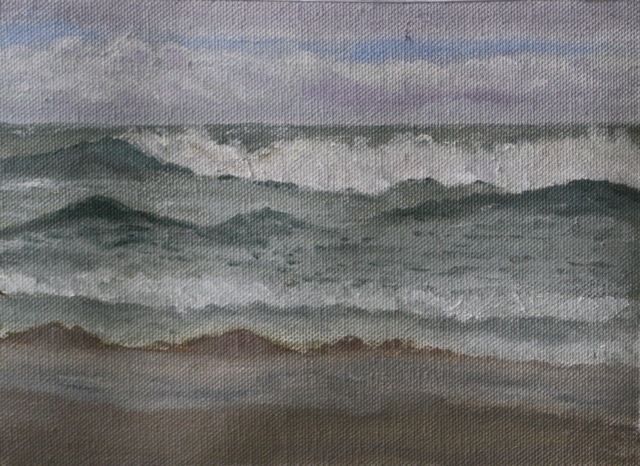 I thought about tossing this painting out of my wave study count but decided that it was worth keeping as a study. If I was going for a finished plein air painting with this one, I probably would have wiped it off. This was a one hour study. I was painting later in the day because the tide was coming in. With the days staying light later I can catch a late incoming tide more often. The weather continues to be a bit unsettled but feels like it is becoming a bit more solid for lack of a better word. The beach changes daily and today there was large piles of kelp from further out to sea. It felt good to be out and painting again!